A Buffalo, N.Y., man charged with animal cruelty wants his dog back, and he’s putting up a fight from his jail cell. Daniel Delaney Jr., 36, was arrested after driving down several blocks in the west side of Buffalo with his dog tethered to the back of his yellow SUV. He did not pull over until he was flagged down and subsequently arrested by a K-9 officer. According to WIVB News 4, Delaney was traveling at about 30 miles per hour with his dog chained to the bumper. By the time Delaney pulled to the side of the road, his dog’s feet were bloody, his pads completely torn off. Delaney has told authorities that he simply forgot that his dog was tied behind the vehicle. But neighbors who witnessed the incident, like Shawntelle Fanin, describe it as horrific. Gotti, a 2-year-old Pit Bull Terrier, has been recovering from his injuries at the SPCA Serving Erie County since October 6, the day that authorities took Delaney into custody on a felony aggravated animal cruelty charge. Delaney has been held at the Erie County Holding Center for the past month, unable to post his $25,000 bail. But that isn’t stopping him from seeking a court injunction to block the automatic forfeiture of the dog. 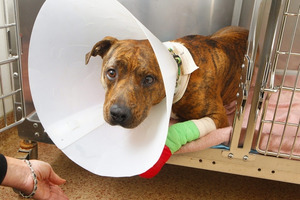 He aims to prohibit the SPCA Serving Erie County from claiming official custody of Gotti, whose paws are still to this day wrapped in gauze due to the severe injuries he sustained. An SPCA lawyer visited Delaney in his cell to inform him that if he did not claim the unlicensed Gotti within the appropriate time frame, Delaney would forfeit ownership to the SPCA. Delaney’s Legal Aid Bureau attorney, Sarah E. Ryan, told BuffaloNews.com that her client cannot post bail and as a result, cannot reclaim his dog from the SPCA. But that doesn’t mean that he doesn’t want his dog back, she said. “He wants to be able to have his due process,” Ryan explained. The SPCA also plans to ask the judge to hold Delaney financially responsible for the high cost of Gotti’s veterinary care. The organization intends to petition the court to force Delaney to cover the more than $1,200 in vet bills they incurred during the treatment of Gotti’s severe wounds. The SPCA plans to do whatever is in Gotti’s best interest — and right now, they say, what is best for Gotti is not to go home with a man who is in jail for animal cruelty. It is not yet clear whether or not Delaney’s request for an injunction will hold any water with the courts, but what is clear is that poor Gotti has a long way to go before his injuries will heal.